The Pet Remedy Heated Pet Pad is a safe and effective heated pad which was originally developed for Petsavers as a post-operative heating mat for vets. It is an easy way of keeping your pet warm and cosy at home. 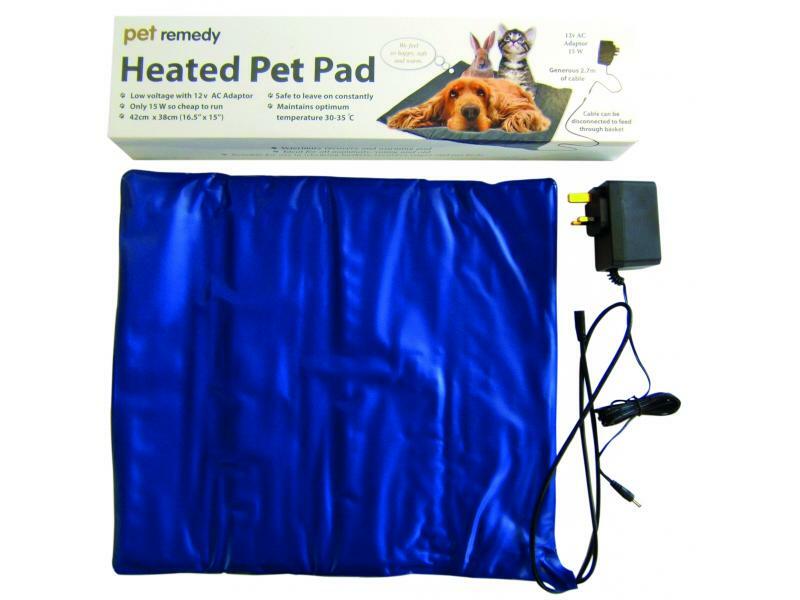 The Pet Remedy Heated Pet Pad is tough and runs on low voltage so is cheap enough to run it can be left on constantly. The lead has a connector in the middle so it can easily be passed through a cage or basket. Below are some recent questions we've received regarding Pet Remedy Heated Pet Pad, including answers from our team. The heat pad is suitable for use in a pet bed, for whelping and in carry baskets. It is also safe to leave on constantly. You would be able to wipe it clean but as it is electrical I wouldn't advise soaking it, just use a antibacterial wipe. Are you able to adjust the heat seating? The temperature on this pad is not adjustable unfortunately. Can you tell me if this is safe for puppies as I couldn't see if this item has a chew resistant cable and as puppies are likely to chew on things I was worried that this might get chewed and then harm the puppy. Thanks for your question. The Pet Pad comes with a protective sheath to protect cable from chewing. The cable length is 2.7m. The heat pad is 42 x 38cm. Is it possible for this item to be installed outside. Planning to use in a cat kennel but the wire will be exposed to moisture in the air and the mat itself could come into contact with moisture. Will this be safe? Unfortunately it says on the product that it is for indoor use only, so we wouldn't advise using it outside. What is the wattage of this heat matt? It's 15W so is very economical to run and due to its low voltage it can also be left on constantly.